What is to be done about high temperatures, rising sea levels, and increasingly powerful hurricanes? What can we do to be less vulnerable to climate change? 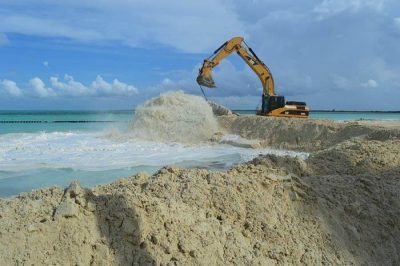 Preliminary observations by groups of specialists in the country indicate that sea level has increased on the island an average of 6.77 centimeters since 1966, a process that has accelerated during the last five years. Since the middle of the last century, the average annual temperature has risen 0.9 degrees Celsius, and the coastline is today more fragile than ever. This reality calls for action, and Cuba is acting on the premise of preparing, to avoid lamenting later. Tarea Vida (Life Task) is the country’s most ambitious project addressing climate change. The plan was approved April 25, 2017, by the Council of Ministers and refers to the ideas Fidel expressed at the Earth Summit held in Río de Janeiro, June12, 1992, where he emphasized the seriousness of threats to the human species. “Projections for the future indicate that the average increase in sea level could reach 27 centimeters by 2050, and 85 by 2100, values that fall within the estimated ranges for the entire planet. This implies a slow reduction in our dry land surface and a gradual increase in salinization, meaning that our underground aquifers will be impacted at a level that must be taken into consideration,” explained Rudy Montero, lead expert within the Environmental Agency’s risk assessment group. Given this panorama, 103 studies have been conducted on dangers, vulnerability, and risks related to weather and precipitation, including the impact of high winds, coastal flooding, and heavy rain. Likewise, research on drought, wildfires, risks of a geological, technological, or health nature have been considered, in order to take action in terms of prevention, preparation, response, and recovery – to confront and reduce risks and vulnerabilities “to adapt to this phenomenon that affects all,” Montero said. Coastal flooding produced by extreme weather phenomena is one of the main dangers resulting from climate change that has been identified. These floods impact human constructions and the natural environment, and along with rising sea levels, put a number of settlements at risk. “We have identified them, and are going to work on new land use plans for each one,” he reported. Agriculture and livestock ranching also figure among priorities to be addressed, given their importance to the country’s food security. Several actions projected address changes in land use patterns as a consequence of rising sea levels and drought: these include reducing cultivated areas along the coastline and in areas affected by saltwater instrusion; diversifying crops; improving soils; as well as introducing and developing varieties resistant to higher temperatures. Also projected is a process of reordering urban planning in identified settlements, and consideration of threatened infrastructure, in accordance with the country’s economic situation. “There are a number of entities that are decisive to the project, such as Physical Planning, that is the guiding body in terms of land use; the University, given its contribution of knowledge via research: the Ministry of Agriculture as responsible for soil resources, among other institutions that must combine forces to achieve the objective,” stated Amado Luis Palma, environmental management specialist for the Citma office in Las Tunas. “The tasks are highly complicated, since environmental investments must be made, which are characterized by their significant cost and special requirements. Those that have been made are based on the research of many scientists, and are today systematized,” the Minister added. Among Tarea Vida’s 11 approved tasks are the identification and implementation of projects to adapt to climate change; assure the availability and efficient use of water to confront drought; reforestation to protect soils and water; stop the deterioration of coral reefs by restoring and protecting them; as well as measures, plans, and projects linked to renewable energy, food security, health, and tourism. TASK 3: Conserve, maintain, and recover the Cuban archipelago’s sandy beaches, prioritizing those urbanized for tourist use and reducing the structural vulnerability of constructed properties. TASK 5: Direct reforestation toward providing maximum protection of soils and water in terms of both quantity and quality, as well as the recovery of the most affected mangroves. Prioritize reservoirs, canals, and the regulatory banks of tributaries leading to the island’s principal bays and coasts.